» PC Builds » Xidax Review, Should You Just Build Your Own PC Rig? « What Kind Of Speakers Do You Like With Your PC Build? Does A Xidax $500 PC Deliver? For the first part of reviewing Xidax (xidax.com) I’d like to get into whether or not a $500 pre-built PC from them would be worth it for the power you get per dollar spent. The pre-built X-2 desktop is what I wanted to look at as it is the lowest price PC they have to offer on the site. I could only get it down to about $595 which includes everything being built and ready to go right from the get go. I have to say, one thing that bothered me going into the system was that the site doesn’t tell me straight forward what parts I have exactly in it. Sure it tells me I have a WD hard drive, but I have to go into edit and get to the different hard drives to see how much storage it actually has in it. It’d be nice not to have to have that extra step in the customizing process. I also have to zoom out on my screen because the top portion gets too much in the way, honestly the whole process seems crowded. My laptop screen is 1440×600 so I shouldn’t have to zoom anything out just to see more of the screen. Maybe that’s just me and it isn’t a big deal but I’ve never crowded on a website like this. With that aside, let’s just get right into the components. I thought that the price as configured was going to be $595…? Alright, so for $715 you can get a PC sent to you that can play World of Warcraft on medium/low and it’ll also be able to play 1080p video. Integrated graphics means that the graphics is coming from the processor, this “gaming” PC doesn’t even have a graphics card! For about the same price you could have a full gaming rig capable of playing all of the latest games, a keyboard, mouse, monitor AND a headset. The only difference is that you’d have to build it yourself which really isn’t that hard at all if you take the time to learn how it’s done. It’s really just a lot of plug n’ play. I’ve got to give it to these guys though… their branding is pretty cool. But for $715? To play games that are more than 10 years old and some indie games? Come on now, that’s not a real gaming PC! This is why I always preach to build one rather than getting a pre-built. Let’s take a look at a more expensive configuration, let’s see if Xidax PCs can at least sorta deliver on a quality gaming experience for those that have a higher budget range. I sure hope that they can… I can tell you right now though, please DO NOT buy a lower priced – entry level rig from here. You’d be leaving WAY too much money on the table for how much power you could really have with that much money. OK, Can They Deliver With A $1,500 PC? If they can deliver a quality experience with those that have a $1,500 budget then I might be able to actually recommend this company for you. I know it sounds like I’m being pretty rough and unfair, but man I despise pre-built PCs. I have yet to find a company that provides a quality shopping experience, a fair price and a good gaming experience all at the same time. It looked as if I could customize their X-5 gaming desktop to meet my budget point of $1,500 as it started at about $1,000. Figured I could edit a few things and get a good PC going. 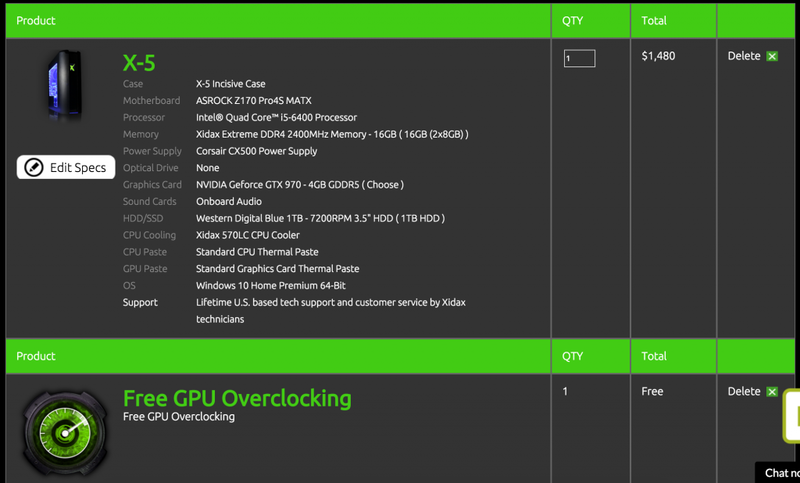 Now this isn’t looking all that bad… especially with a free GPU overclock! The only thing I changed about the build was the graphics card. It had a R7 250 listed and for about $310 more I could have the 970 instead. If you’re paying anywhere near $1,000 then something like a R7 250 isn’t going to cut it at all. If you’re spending a lot of money then you’d best be getting as much power as you can get out of it. Keep in mind that with a $1,500 budget you could definitely build one yourself that’s even better. You’d be able to have a 980 instead of a 970 and an i7 would still be an even better pick. BUT – for those that are either too afraid to build their own or if they want some really cool custom features with their build then I’d definitely say to opt for these PCs. The custom graphics you get to pick from are awesome! If you wanted to, you could add custom graphics like those above. There are plenty more options too, though it’s quite expensive to get done. From looking at the photos, they look like they are extremely high quality. Xidax can definitely deliver on the customization and they can deliver enough for those that are looking to spend more than $1,000 on a pre-built PC. Oh, and that $120 shipping expense didn’t pop up either. As I said earlier, I despise pre-built PCs. There is never enough value when looking at the power per dollar spent. 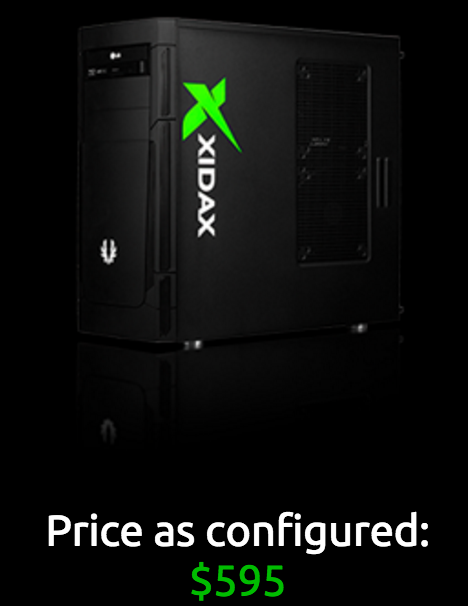 But with Xidax pre-builts, I would trust them to put together a mean PC. I suppose it would be nice to just take the PC out of the box, plug it in and start gaming right away. Personally, I really dig the process of building one myself. When I first got into PC gaming I had absolutely no idea how to put one together but after following a few videos and researching, I pulled the plug and just bought the parts I needed. All in all, if you really just don’t want to learn how to put your own build together and if you’re looking to spend more than $1,000 on a gaming PC then you’ll probably want to look into a Xidax PC. I really dig the customization options and from the looks of the team behind the company, the PC would be put together with quality in mind the whole time. So, are you going to be looking into a Xidax pre-built? Or are you going to put your own build together? If you are going to put your own build together then be sure to check out the different guides I have available on the site here, highlight “PC Builds” in the top navigation and choose your budget point! Tagged pre built gaming computer reviews, xidax computers. Bookmark the permalink. 17 Responses to Xidax Review, Should You Just Build Your Own PC Rig? I just ordered a laptop from there. I agree with you on the high end desktops are a fair value. One thing I feel like you should have touched on is the main reason people a prebuilt and that’s the warranty. If you factor the warranty into the cost I think the desktops are a great deal. I can build my own but if this laptop works out I’m seriously considering them for my next desktop. But on Amazon you can also get a 2-year warranty plan for the PC parts making building your own having its own value in that context! Not to bring this back to life… but Xidax offers a LIFETIME warranty. Which is insane. Another thing to make them that much more awesome! As long as people pay sort of top dollar for the higher end builds then I can definitely see the value there. I just customized one of their comps they are charging an unrealistic amount. For example almost $600 for a Samsung Evo 850 1TB. Amazon or Newegg.com you can get 2 for that price. How or why someone would pay that much of a mark up for anything product is just crazy. There are some pretty crazy prices man, the only way it makes even a little bit of sense is by getting a more expensive PC. But even then, you can have way more power behind a PC by putting one together yourself. A LOT more power. Though I do have to give it to Xidax, their PCs look super slick and they do a heck of a job putting them together! Not only are the prices out of this world! The options are crap. This seems like a company taking advantage of, not so savvy, first time PC gamers. Putting together a computer is like putting together legos, If it looks like it should go in that slot, then it probably does. Don’t get screwed! I agree for the most part Kevin. I mean, these guys put together PCs in a high quality way so it’s not like they’re just quickly throwing pieces together but the pricing is definitely not nearly as fair in comparison to putting together a build of your own! As the proud owner of a Xidax, I must say that I’m 100% satisfied. My last three gaming computers were built by me. And anyone who has built their own KNOWS that you will have some issues. Whether it’s compatibility issues or non-working hardware or out-of-stock problems, there is always at least one. However, I had not one issues with my Xidax. Sure, I spent a little more, but the lifetime warranty and “trade-in/buy back” options are too good to be true. And their customer service is next to none. The next time I’m in the market for a computer Xidax will be my first choice. That’s good to hear man, they definitely put together high quality PCs! Simply comes down to if someone wants to pay the premium to have those features and what not. Having your PC working right out of the box has a value of its own! I have built many a rig, and yes, you can get more for less if you go that way. But, let me tell you an awesome story. I had Xidax build me a mainstream gamer… 6700k/1080FE at a price at least 25% lower than other builders. So, long story short UPS massacred it in shipping. Before I accepted delivery I called Xidax. Within 90 seconds I was talking to the head of customer service who had me refuse it. Total length of call maybe 5 minutes. A replacement rig was built and in my hands within 72 hours, LONG before my busted rig ever made its way back to Utah. Try that with Dellianware. The other point not mention is you can get financed for the pc if you don’t have that kind of dough setting around . I purchased a build from the at around $1450 ran good for about 8 months then had some CD player issues it wouldn’t read certain disk .. cleaned it and all but still no dice . Called them they wanted a video of the sounds and screen issues it was reporting but I needed the player now . Being they are located in Utah I believe I just ran out and got one that day and was up and running again . 2nd year in system completely stops running with out a power supply tester to confirm at least one possibilty of its issue I called them and set up for shipping it to them since I didn’t keep the box it came in had to let ups box it for me and of course insurance at a total cost &111 both ways GEE ..we will see if the lifetime warranty is worth it . That warranty for lifetime is definitely going to be nice, you can always finance through Amazon as well I’ve had friends that financed with a custom build so financing is still an option from going with a build of your own. Hopefully the issues stop there! THIS COMPANY HAS THE WORST SUPPORT TEAM I HAVE EVER SEEN IN ANY TYPE OF COMPANY FOR ANY TYPE OF INDUSTRY I KNOW OF. DONT EVEN BOTHER TRYING TO CALL THEM PAST 5PM YOU WILL STAY ON HOLD FOR 1.5 HOURS BEFORE BEING DROPPED. IF YOU ARE ABLE TO OPEN A REPAIR TICKET YOU WONT SEE YOUR COMPUTER AGAIN FOR TWO MONTHS. THEN THE SUPPORT STAFF WILL MAKE A BUNCH OF PROMICES THEY HAVE NO INTENTION OF KEEPING AND INSTEAD CLOSE OUT ALL YOUR TICKETS EVERY TIME YOU TRY TO GET A STATIS. MY LAPTOP HAS HAD TWO DEVICE ENDING EVENTS IN UNDER THREE YEARS. NEEDLESS TO SAY I WONT BE BUYING A DESKTOP FROM XIDAX. I’m not certain but maybe Xidax has a support team on Twitter or another social outlet? Sometimes companies make sure to make things right when there is a social media presence on a problem… though they should have been able to know that you’ve been needing help for quite some time now.